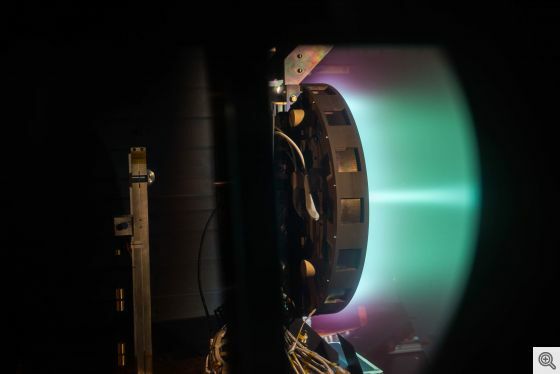 October 25, 2017 – An advanced space engine in the running to propel humans to Mars has broken the records for operating current, power and thrust for a device of its kind, known as a Hall thruster. The X3 is one of three prototype “Mars engines” to be turned into a full propulsion system with funding from NASA. Scott Hall, a doctoral student in aerospace engineering at U-M, carried out the tests at the NASA Glenn Research Center in Cleveland, along with Hani Kamhawi, a NASA Glenn research scientist who has been heavily involved in the development of the X3. The experiments were the culmination of more than five years of building, testing and improving the thruster. 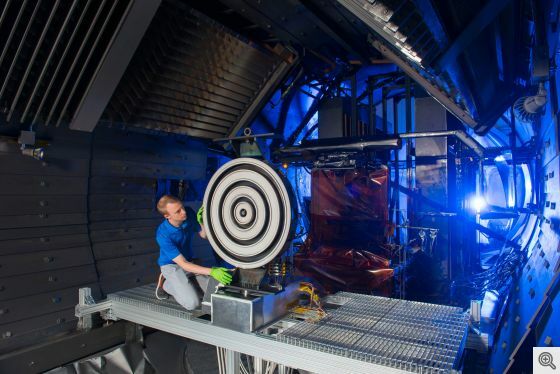 NASA Glenn, which specializes in solar electric propulsion, is currently home to the only vacuum chamber in the U.S. that can handle the X3 thruster. The thruster produces so much exhaust that vacuum pumps at other chambers can’t keep up. Then, xenon that has been shot out the back of the engine can drift back into the plasma plume, muddying the results. But as of January 2018, an upgrade of the vacuum chamber in Gallimore’s lab will enable X3 testing right at U-M.
For now, the X3 team snagged a test window from late July through August this year, starting with four weeks to set up the thrust stand, mount the thruster and connect the thruster with xenon and electrical power supplies. Hall had built a custom thrust stand to bear the X3’s 500-pound weight and withstand its force, as existing stands would collapse under it. Throughout the process, Hall and Kamhawi were supported by NASA researchers, engineers and technicians. “The big moment is when you close the door and pump down the chamber,” Hall said. Looking ahead, the X3 will at last be integrated with the power supplies under development by Aerojet Rocketdyne, a rocket and missile propulsion manufacturer and lead on the propulsion system grant from NASA. In spring 2018, Hall expects to be back at NASA Glenn running a 100-hour test of the X3 with Aerojet Rocketdyne’s power processing system. Gallimore is also the Richard F. and Eleanor A. Towner Professor, an Arthur F. Thurnau Professor and a professor of applied physics. Kamhawi is also Hall’s NASA mentor as part of the NASA Space Technology Research Fellowship. The $1 million upgrade of the test facility in Gallimore’s lab is funded in part by the Air Force Office of Scientific Research, with additional support from NASA’s Jet Propulsion Laboratory and U-M.